How happy are you with your smartphone? 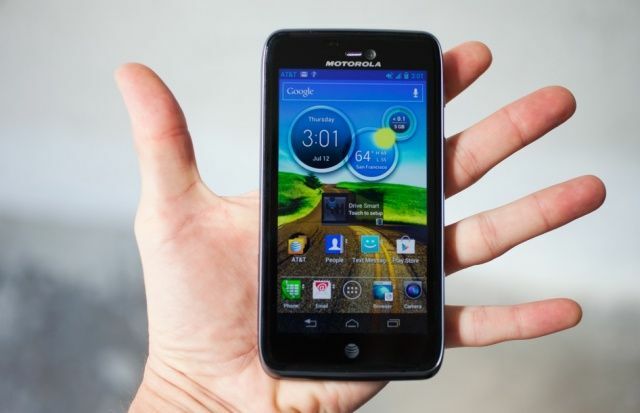 According to a survey of 92,825 smartphone user in the United States, the Motorola Atrix HD delivers the most satisfaction with an impressive 8.57 out of ten. Another Motorola device, the Droid RAZR M, is ranked second with 8.5 out of ten, while the iPhone 5 is ranked fifth with just 8.23 out of ten. The results come from OnDevice Research, who asked smartphone and tablet users around the world how satisfied they are with their devices. Here are the results for the United States. The results are pretty surprising when you consider a device like the Samsung Galaxy S III, which has sold incredibly well since its release last May and earned heaps of praise from users and critics alike, doesn’t even feature in the top five. It does feature in the U.K.’s top five, however, which looks completely different. But as noted by AppAdvice, OnDevice’s data raises a lot of questions. First, it doesn’t specify how many respondents actually used each device. So it could have 30,000 responses from iPhone 5 users who give the device an average score of 8.23, but only three responses from Motorola Atrix HD users who all gave the device gleaming reviews. Then there’s the brand satisfaction part of its report. According to that, customers in the U.S. are most satisfied with Apple devices, giving the company a 7.72 out of ten. Google is ranked second with 7.68, Motorola is third with 7.49, and HTC is fourth with 7.49. 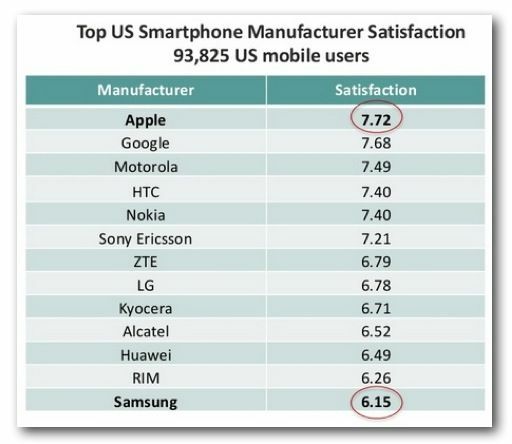 Samsung is last — behind RIM (now BlackBerry) — with just 6.15. 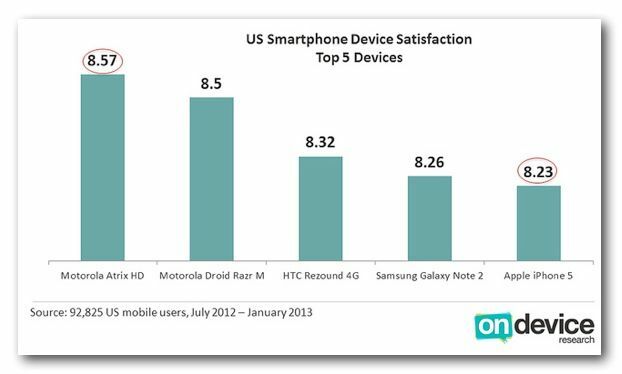 It seems strange that Google is ranked second for satisfaction, but none of its device are included in the top five. 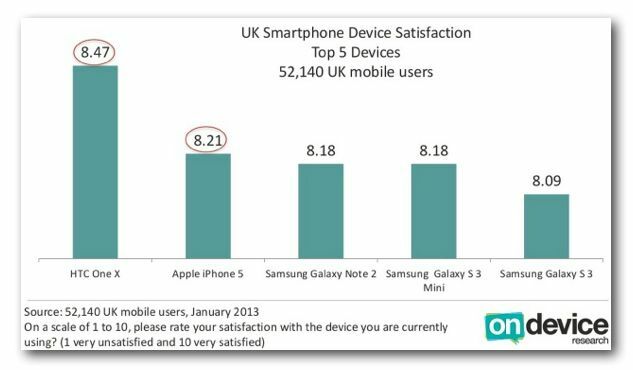 OnDevice also says that it asked “mobile and tablet” users how satisfied they were with their devices, yet not one tablet features in the top five. Who doesn’t love their iPad? What’s interesting is that OnDevice notes the top five devices in the U.S. are all 4G handsets, and that users with a 4G subscription reported more satisfaction (7.76) than those without a 4G subscription (7.28). Those with 4G also reported a higher mobile network operator satisfaction (7.15) than those without 4G (6.67).